Gustavus Adolphus College begins its 145th academic year Wednesday, Sept. 6 when classes commence for the college's expected 2,550 full-time students, including 680 first-year students. The Gustavus Adolphus College campus was undamaged by yesterday's (Aug. 24) storms. 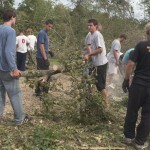 Students who are on campus for athletic practice or residence-hall training are helping with clean-up efforts in the area. 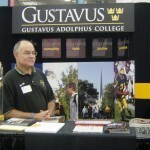 Once again Gustavus Adolphus College will have a booth at the Minnesota State Fair. Come see us at our booth in the education building, open from 9 a.m. until 9 p.m. each day of the fair: Aug. 24 through Sept. 4, 2006. Gustavus Adolphus College is once again ranked among the top liberal arts colleges in the nation by U.S. News and World Report's annual college rankings. Gustavus is one of six Minnesota colleges in the top 100 national liberal arts colleges for overall quality.